Other Common Names: Burnet, saxifrage, salad burnet, small pimpernel, solidstem burnet saxifrage, lesser burnet, small burnet saxifrage, almindelig pimpinelle (Danish), Kleine Bibernelle (German), pimpinela blanca (Spanish), Boucage saxifrage (French), bakkablóm (Icelandic). Habitat: This plant is native to Europe and Asia. The species have been introduced and naturalized in New Zealand and North America. It is mostly found in warm and sunny habitats where the soil is dry, stony and often calcareous. 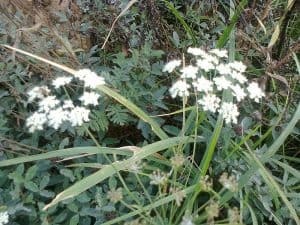 Description: Burnet saxifrage is a perennial plant of the Apiaceae family (the carrot or parsley family) that grows from 15 to 60 cm high. The plant has a long, thick taproot with a strong scent. The basal leaves are pinnate with oval and deeply serrated leaflets of different sizes and the stem leaves are alternate and of a different shape. The flowers are tiny with white, yellowish or pink petals and the seeds are small, dark brown and ovate. The plant blooms from May to September. Plant Parts Used: It is mostly the root that is used in herbal medicine but sometimes the leaves. The root has a spice-like odor and a sharp, bitter taste. The roots from younger plants are harvested in September and October and from older plants in March and April. The root contains an essential oil (up 0.4%), 1% saponins, bitter substances, tannin, polysaccharides, resin and the coumarins pimpinellin, bergapten and umbelliferone. Burnet saxifrage has been used for a long time in folk medicine. The Greek physician Dioscorides (1st century AD) allegedly used the herb as a diuretic agent and the Danish physician Henrik Harp Strings (the 1200s) used the root against heart disease, edema, and cough. The dried root is said to have an expectorant, anti-inflammatory, antispasmodic and mildly astringent effect. It is used to dissolve mucus in the airways and to treat cough, sore throat, bronchitis and other infections of the upper respiratory tract. Extracts of the herb can be used as a gargle to reduce inflammation in the mouth and throat. Extracts and a decoction can be made both from water and alcohol. Burnet saxifrage may also have diuretic properties and can work well for kidney and urinary tract disorders such as cystitis and stones in the urinary tract. The herb has been used traditionally to stimulate milk production in lactating women. When the herb is taken internally it may stimulate appetite and reduce the formation of intestinal gas. 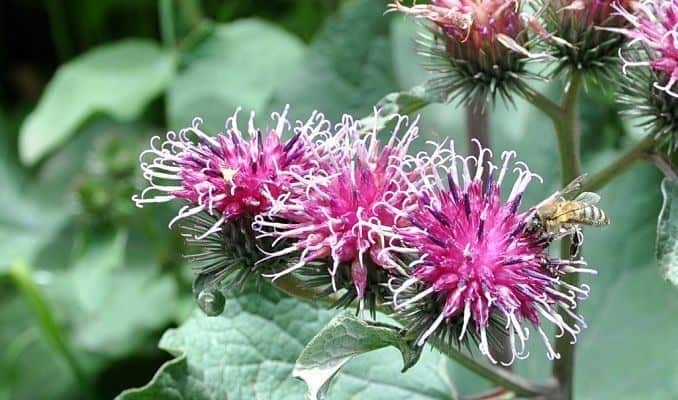 Additionally it is thought to be useful herb for diarrhea. 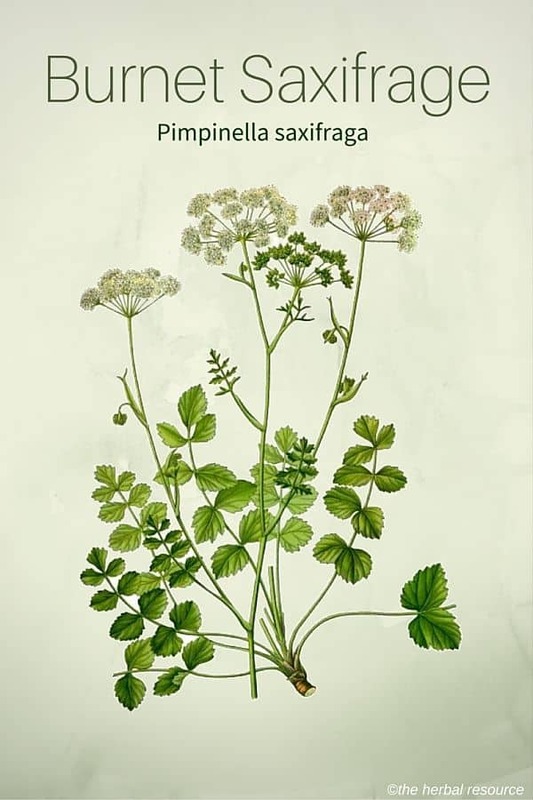 In the past, burnet saxifrage was used as a mild sedative and because of its antiseptic and healing properties, it was used topically as a treatment for wounds and other minor skin injuries. The young leaves can be used as a component in mixed salads or as a garnish for cocktails. The leaves have a taste that is somewhat reminiscent of cucumber. An essential oil is extracted from the seeds and is used to add flavor to sweets and to add a slightly bitter taste to liqueurs and pharmaceutical products. 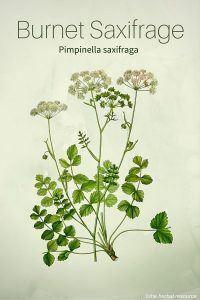 As an herbal medicine, the daily dose of burnet saxifrage is 6-12 g of the dried root. When the herb is used in the form of tea the recommended dose is often one or two teaspoons of the finely chopped root in a cup of boiling water. As a remedy for coughs, one cup of the tea can be drunk three to four times daily. No side effects, contraindications or interactions with other medications have been reported by the use of the root in recommended doses. Large doses can cause contractions of the uterine muscles and thus have an abortifacient effect. Therefore, the herb should not be used during pregnancy.